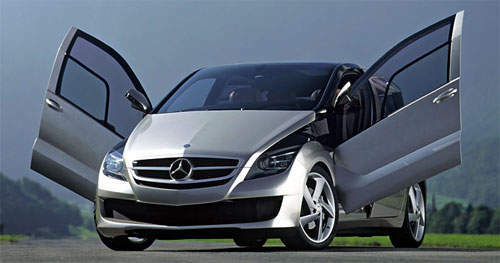 The Mercedes Benz F600 Hygenius Concept is a research vehicle by Mercedes Benz powered by a forced inducted fuel cell hybrid powertrain. With fuel cell technology employed, emissions is zero and consumes the equivalent of 2.9 litres per 100km. Mercedes calls the air compressor an electric turbocharger, though I don’t know why. Don’t ask me why LOL! There are no exhaust gasses to spin up this turbine. Oh well, up to them! The fuel cell powertrain makes a constant 82hp and 250Nm of torque. Combined with the hybrid electric motor integrated into the rear axle powered by lithium-ion batteries, the total power output for the F600 Hygenius Concept is 115hp and 350Nm torque. 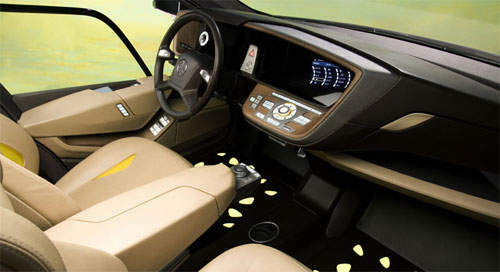 On low speeds such as parking and traffic jams, the car runs on the electric motor alone, relying on the fuel cell drive only during acceleration. The electric motor works as a generator when run in reverse, charging the lithium ion battery pack during braking. Top speed is approximately 170km/h. 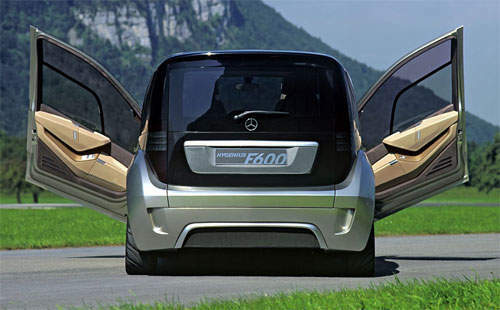 Mercedes Benz has also enabled the F600 Hygenius Concept to act as a mobile power source. Several houses can be hooked up to the electric motor so provide electricity during a blackout. This redefines the meaning of ‘multi purpose vehicle!’ :D There is a power socket at the tailgate of the vehicle so you can hook normal electrical devices up to it. Imaging bringing this vehicle to go for a a trip in the outdoors. You could hook up your electric steamboat or BBQ grill to it. The seats can be turned around 180 degrees on it’s axis. This is useful when you want to bring a child around in the front passanger seat. You can just turn it around and face the chair backwards. The backrest cushion also has electric motors in them. These motors can bend the cushion into shape to fit your body’s contour. The tailgate also has a nifty feature. When you open it, the lower half of the tailgate folds inwards, while the upper area swings upwards to open the tailgate. This allows the tailgate to swing open in a much tighter spot than it normally could if it had to swing upwards at full length. 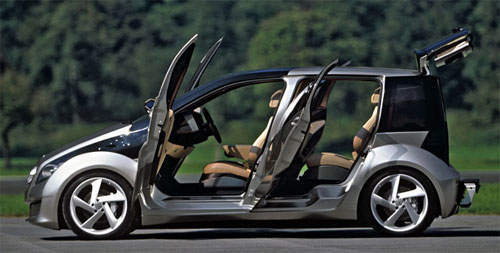 The doors also employ this space saving concept, though differently. It swings outwards and upwards as well, held up by gas absorbers. All of the lights on this car are powered by LEDs. The headlamps are powered by triple projector LEDs. Signal lamps and brake lamps are also powered by LEDs. LEDs take up less power and generate less heat. Ideal for a hybrid fuelcell car. There are also video cameras mounted on the wing mirrors to help you when you want to change lanes. Footage from these cameras are projected onto the windscreen at a point 1.4 meters in front of the car. This is to reduce driver eye strain. Your eyes can get pretty tired if you keep having to refocus your eyes from the traffic ahead to the side mirrors. Ever heard of some unobservant driver opening the car door without looking? A car coming from behind could knock the door off if you open it without checking. The wing mirror video camera detects if there are any incoming objects and temporarily disables the doors from being opened until the object has passed. No more knocked off doors! 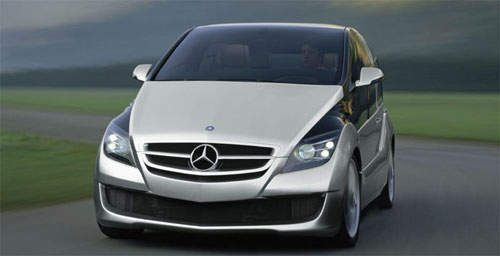 Mercedes Benz intends to bring fuel cell technology to the mainstream between 2010 and 2015. That’s a decade from now, somewhere in my lifetime! Which brings me to think of the people purchasing Proton Wajas in Malaysia with 9-year hire purchase loans. By the time they finish paying off the loan, their cars would be severely outdated!